Access to Domestic and International Paradise Lounges, Access to international partner lounges, Priority check-in, Guest passes, Discount on Air Niugini and retail merchandise, Priority Waitlist, Advanced Seat Selection, Priority Baggage Handling. Executive Club Gold, Silver and Minors members are now able to transfer their points as an additional benefit. You can Meet, Stay and Play at a Coral Sea Hotel where you will find quality accommodation, meeting & conference facilities, dining & entertainment. The perfect choice for the business traveller. Avis is the leading car rental company in Papua New Guinea, servicing both the leisure and business traveller. With 12 locations around the country, including all major airports. Loyalty Points can be used for more than just travel. Now you can shop gifts for your loved ones. Make the most of every journey by taking advantage of the exclusive privileges and services offered by Air Niugini's Silver Membership. Your Membership card identifies you as a valued customer and is your passport to all the privileges available to Silver Executive Club Members travelling on Air Niugini domestic services. 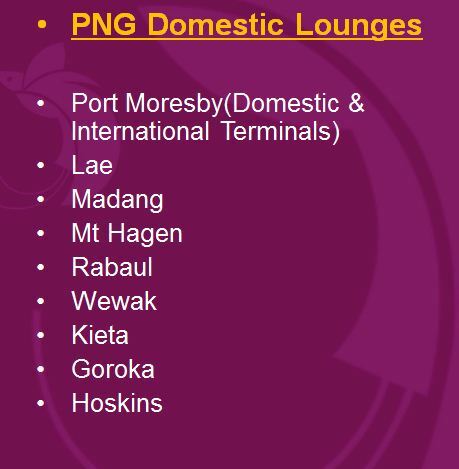 Enjoy our increasing network of domestic Executive Club Lounges in PNG with Silver Card Membership.